Mark your calendars for the big weekend - October 22 & October 23 at the Monroe Community Park on S. Main St. Event hours are 9am - 9pm Saturday and 9am - 3pm Sunday. There will be parking on site and shuttles from the IGA & old High School lots, running every 15 minutes from 11am - 6pm on Saturday & 11am - 4pm on Sunday. There are a wide array of tents and booths to visit with different activities happening all day long. We have an exciting group of Commanders arriving - including Abraham Lincoln, Jefferson Davis, George Armstrong Custer, Robert E. Lee, Ulysses S. Grant and John Hunt Morgan. We have something rarely seen at a reenactment: a mortician performing a rare embalming. We have Dr. Mary Edwards Walker, first female US Army surgeon and only woman to receive the Congressional Medal of Honor. Battles are at 2pm. (you'll want to arrive early). There will be rifles and cannon and, yes, cavalry horses. To mark this special inaugural event, we will have a very limited number of commemorative coins for sale at the Command Post. The Ladies Tea has extremely limited seating. Please RSVP for tickets or stop by the Command Post Saturday morning. I want to take this opportunity to give a HUGE THANK YOU to our sponsors!! The Comfort Inn Monroe - there are discounted $41.99 rooms available! 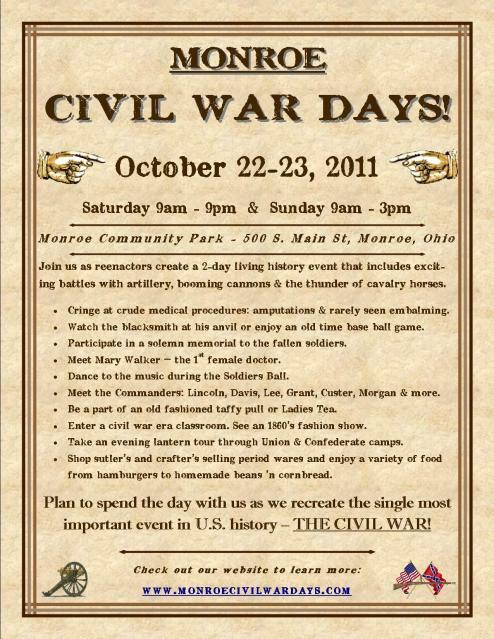 Oh, and its never too late to volunteer: monroecivilwardays@gmail.com.